Today is my maternal grandmother's 14th year remembrance, with each passing day... i miss the woman who formed and moulded me, I was the only grandchild she raised and who lived with her...seems just like yesterday but it's 14years already...it happened on a Saturday, late at night...my aunt had just left her for a couple of minutes and by the time she came back she was gasping for breath. Thing is she was asthmatic but had not had her attack for many years, so the surprise on every one's face when they saw her having an attack...I remember my mum coming over to her friends house, where I had gone to spend my summer break, with eyes that refused to stop tearing telling me, mama was gone, I refused to believe, i refused to cry,i was meant to see her that day...I was not allowed to attend her burial, because everyone felt i could not handle seeing the dead, i was just 11...everyday I pray to Allah to forgive her sins and grant her Aljannah Firdaus (heaven). On Saturday, was at the airport to say farewell to my cousins(Detola, Deola and Kabirat), who were travelling to the UK, not sure when next we would see, but thanks to facebook, at least we get to keep in touch. 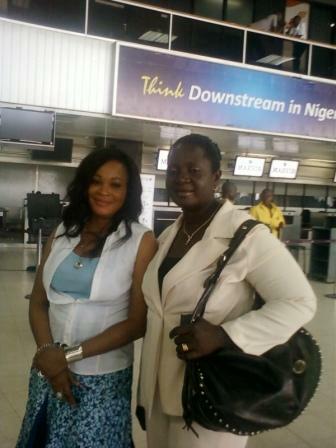 The airport was filled due by 6.30am due to the environmental curfew, ran into Bukky Wright, one of Nigeria's finest Yoruba actress, my family friend wanted to have a picture of her, so i became photographer. 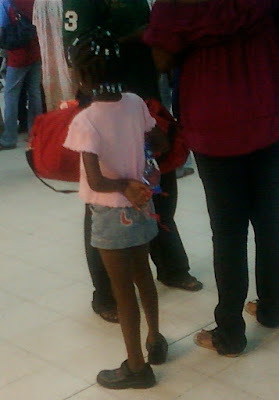 Also saw this little kid at the airport, she is pretty i must say, but what caught my attention was the skirt, it is really short, as in the girl was busy pulling down the skirt. Also, wrote my masters qualifying exam at Unilag and I would say it's a 60-40 chance of me getting admitted. Am so not keen about studying the course, but my intended course requires 3yrs post graduate experience. At least I did not waste my energy and money buying, the past questions, as the questions were so 360 degrees far from what most people crammed in the past questions. Introducing: African Genes, a blog for those who have an eye on tomorrow's Africa. It is set to promote and project the best of Africa. Follow me on my journey in unveiling africa's best. Back to work and life as i know it for now...a wonderful week to everyone. Yeah, they start by wearing extremely short skirts at3 yrs old. Sad, right? sad right and thanks for the wish. Sorry abt your grandma, it's never easy losing a loved one..take heart! Lag and that their exam..it seems tho that the pass rate is always high.wish you d best! Aww I am so sorry to hear abt ur grandma. It is always tough to lose someone you love. *sigh* life! Congrats on ur 60-40 chance of getting into d masters program @ unilag (my mom's an alumni there). I'm sure u will though! Kids clothing these days are rather interesting, to say the least. Good luck with that exam. U'v got to believe Lara. God will give it to you if you believe. Abt d skirt... funny. U shld go to Asia, tht's so normal. lol. It good how the girl is pulling it down though, it means something on her inside does not appreciate it. what do u think?